So many decisions… Wig? Hat? Scarf? On my very first visit to the oncologist, I sat in the lab to have blood drawn with another young woman. She was so stylish—skinny jeans, tall boots, and a long scarf tied around her bald head. Somehow, at that moment, I knew that I’d spend most of my time in a scarf. Just about two weeks before, I’d headed to Zoe Boutique to hang out for Fashion’s Night Out in Alexandria. I love a good swag bag, and that night was no exception—the pebbled Velvet scarf on the far left was part of Zoe’s swag for the night. It turned out to be the perfect “neutral” and I wore it more than any other scarf, with just about everything. It’s a jersey (t-shirt) knit, and so comfy, and I liked having the long “tail” hanging behind me. Maybe I was missing my pony tail. Second from the left was my second favorite—a silk scarf that I picked up at Amalgamated Classics Clothing and Dry Goods—a fun little vintage shop in Del Ray, I wore it with a few of my favorite bulky brown sweaters—it was a square scarf and tied more like a kerchief without the long tail. The rest actually got more wear around my neck, when I was looking to hide the straps and bulkiness of the post-surgical compression gear. 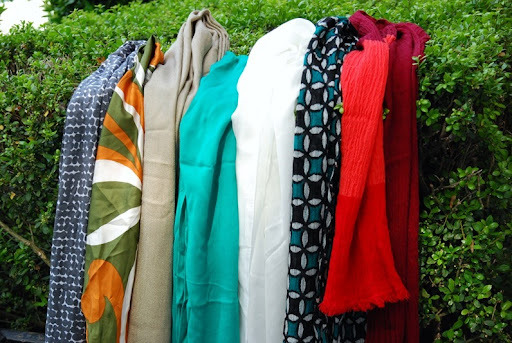 I looked for more scarves, but came up with few options, in the fall, most of the scarves were too bulky. Now that it’s spring, I feel like I see scarves I’d like to wear on my head all the time! (I have to fight the urge to hoard them!) I’ve also noticed that there is quite a good selection of scarves at consignment and thrift shops, which is great not only because they’re not as spendy, but it’s easier to pick up a pretty unique selection at a place like that. Wish I’d been looking there last fall!